This event is conducted by Edumithra Intellectual Services, Kerala. ISO – 2015 and has two major rounds. An Online screening test on 3rd May 2015 in which 2000 candidates participated. Of these, 200 candidates are selected for the next round, a Quiz and interactive session with Dr.Chandradathan, former Director of Vikram Sarabhai Space Centre, Thiruvananthapuram. 75 candidates participated in the Quiz conducted at the Kerala Science & Technology Museum and Priyadarshini Planetarium, Thiruvananthapuram, on 14th June 2015. The Quiz had written and audio-visual rounds. The interactive session was with the Quiz Master, Dr.Anand Narayanan, a Doctorate in Astronomical Sciences from the University of Pennsylvania with work experience working as Scientist in Wisconsin. Currently, he is the Associate Professor in the Indian Institute of Space Science and Technology (IIST), Thiruvananthapuram. Prizes for the top 3 scorers were given. Nayan Rajesh stood 11th. 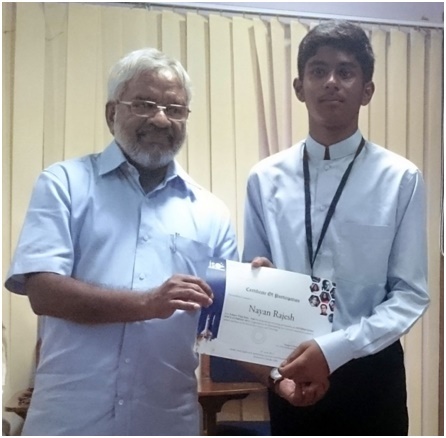 He is shown receiving a certificate from Dr. Anand Narayanan. For more details on the Olympiad, please visit www.internationalspaceolympiad.com. Pick and Speak competition: Anonya Mahadev won the Ist prize; and Anurag Anand Vaidya won the Consolation prize. In the Skit Presentation competition the following students Consolation prizes: Swathi Meghana and Panchami.T.N. of Std IX; and the following students of Standard X: Nikhil Bharadwaj, Rishab P Jain, Amogh Shashikumar, Anurag Anand Vaidya, Sarthak Somani and Pranav. 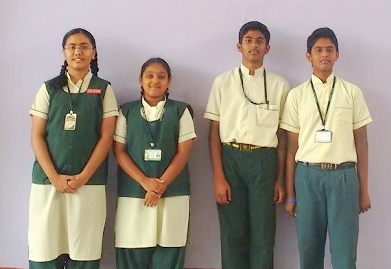 The following students won the thrid prize for Patrioritic singing: Vishnu , Abhigna and Jnanika all of IIIrd Standard and Asmitha and Vijayendra of IV Standard. In Bhajan singing, the following students of Standard V won the IInd prize: Rohith.S.Murthy, Rajendra Prasad, Manyashree, Vangmayee and Veeru Anant Kulkarni. The following students won the IIIrd Prize: Sanjana Tikare and Raksha, S. of (Std X); Panchami, T.N. and Swathi Meghana of Std. IX; Prerana, Janhavi, K P Urs, Anirudh of Std. VIII; and Sukruth.P. ; and Vaishnavi Bharadwaj of Std VII; Ashtritha Kiran Seshan of Std. VI. The following students won the thrid prize for recitation of ‘Kalabhairavashtakam’: Rohith.S.Murthy, Rajendra Prasad, Shreya.C.V. , Sinchana.V. and Manyashree all of Vth Standard. T.N. Panchami (IXth Class) won the first prize for Bhagavad Geeta recitation. Vaishnavi Bharadwaj won the Third prze for Namaramayanam Recitation. Namratha (IVth Class) won the Third prize for Story telling. Anura Anand Vaidya and Sarthak Somani of Standard X won the Consolotion Prize. Sanaathan.R. of Std VII won a silver medal in the Dwithiya Examination. The Department of Education at the Yelwal cluster level in the Primary, Middle and High School Sections held the Pratibha Kaarangi competitions. Many of our students won prizes at the competitions. The photo on the left shows our winners. Given below are the different competitions and prize winners in the Primary, Middle and High School sections. 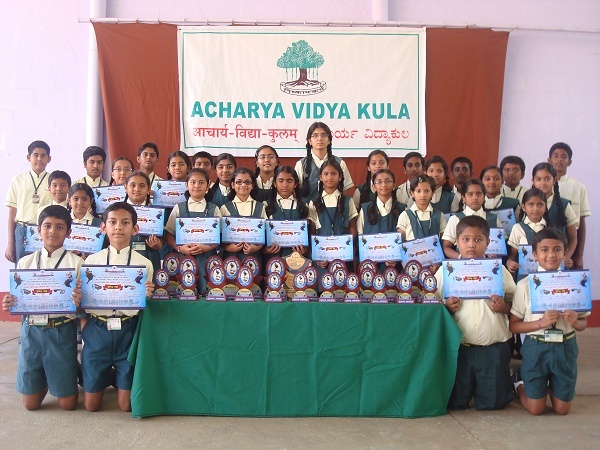 The following students won prizes at the District Level Prathiba Karanji Competition held recently. Their pictures are given at the left. 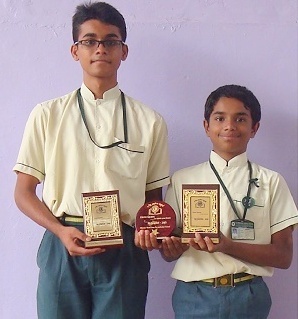 Anurag Anand Vaidya of class X and K V Sudhanva of class VIII were declared Runners-up [IIrd Place] at the Quiz Competition conducted by Mysore West Lions Sevaniketan School on 4th Septemebr 2015. The proud winners are seen in the picture alongside. 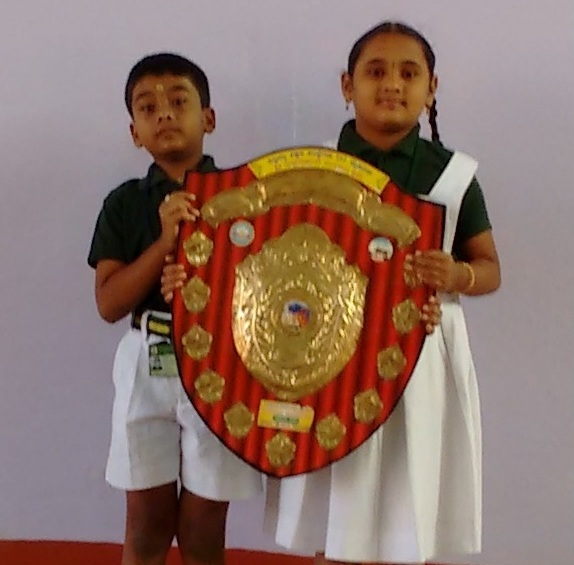 Namratha M (Std IV) and Anirudh M (Std III) students of Acharya Vidya Kula participated in the Bhagavadgeetha Chanting Competition conducted by Sadvidya Institution on 24th November and won the Rolling Shield in the Primary Section. Namratha M also won the I Prize. Congratulations Namrata and Anirudh. 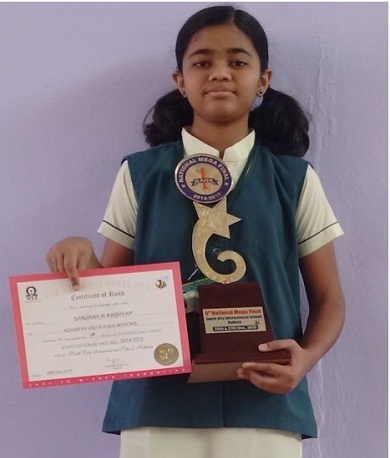 Sanjana R Kashyap of class VII has bagged the I Rank in the WIZ National Spelling Bee contest Conducted Recently at KOLKATA. Congratulations Sanjana. Mysore Traffic Police conducted competitions during The Traffic Awareness program in Mysore. 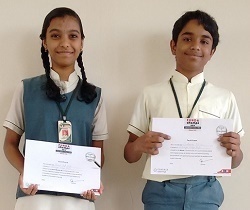 Our students, Prateeksha S Nair of Standard IX B and Tarun of Standard IX A won the Ist prize in Eng.Debate and English Essay Writing Competition respectively. Their pictures are given below. 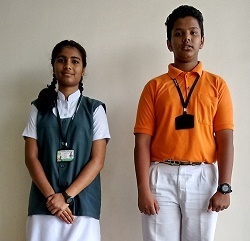 Sudhanve KV of Standard VIII secured I prize and Jahnavi KP Urs of Standard VIII secured 2nd Runner Up. Their pictures are seen below. 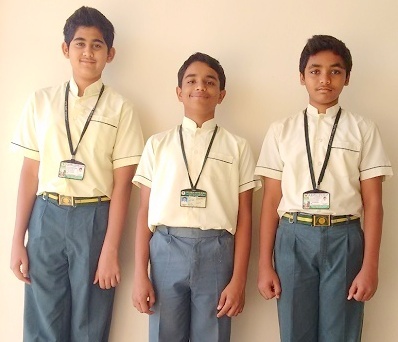 K V Sudhanva, Sudanshu Bharadwaj and K V Nagadhanush, students of class VIII of AVK have been selected for the 3 weeks Catch Them Young programme to be conducted by INFOSYS Technologies, Mysore this summer. Their picture is adjoining. 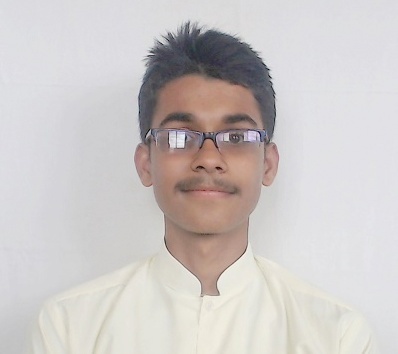 Anurag Anand Vaidya , Student of Standard X at Acharya Vidya Kula has secured the 21st Rank in National Talent Search Examination -2015 Stage 1 conducted by Department of State Education Research and Training(DSERT) . He is now qualified to participate in stage 2 to be conducted by NCERT in May 2016. We congratulate Anurag; this is not the first time he has made the School proud. He is seen on the left. 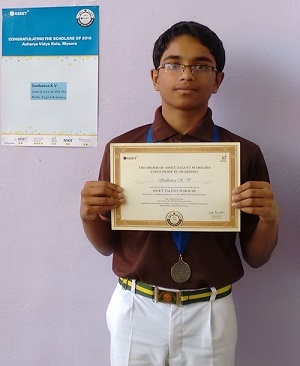 K V Sudhanva now a student of class IX of Acharya Vidya Kula has been awarded the ASSET Talent Scholar Award (in class VIII) by EDUCATIONAL INITIATIVES Pvt. Ltd. This award is given to students whose scores are in the 95th Percentile in the ASSET Talent Search Exam 2015-2016. His percentile scores are 96 in English, 98.8 in Mathematics and 99.6 in Science. Congratulations Sudhanva.